Ringed seals are the 'classic' Arctic seal in many regards, being found as far north as the Pole because of their ability to keep breathing holes open in ice that can reach 2 metres in depth. This species is certainly one of the most vulnerable of the high-Arctic seals to the declines in the extent or quality of sea ice because so many aspects of their life-history and distribution are tied to ice. Ringed seals also require sufficient snow cover on top of the ice to construct lairs for resting, giving birth and caring for their young. The pups are born weighing only 4 kg and both ice and snow must be stable enough in the spring season to successfully complete the six week lactation period. Premature break-up of the land-fast ice can result in the pups being separated from their mothers, leading to high rates of pup mortality. 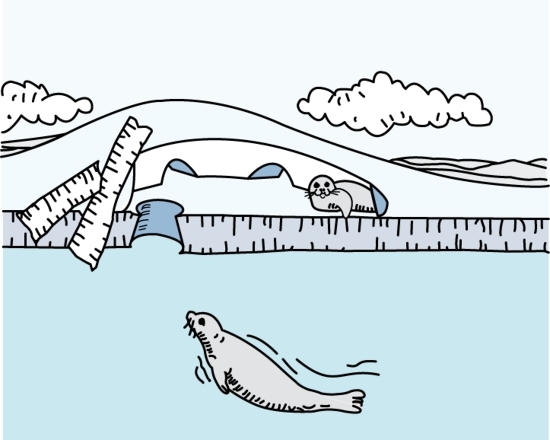 Spring rains, or high temperatures in spring, can cause the roofs of lairs to collapse, leaving ringed seals subject to increased predation and risks from exposure. Years in which insufficient snowfall takes place prior to breeding results in a similar phenomenon. Ringed seals are the principle prey for the top predator in the Arctic food chain – the polar bear. 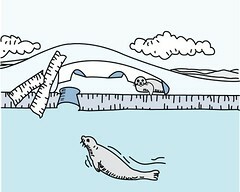 Declining sea-ice quality extent and season have potentially dire consequences for both of these Arctic animals. For any form of publication, please include the link to this page and give the creator credit (in this case Robert Barnes, UNEP/GRID-Arendal) If the high-resolution file is not available, please contact grid@grida.no for request and permission for usage.